Leah Maroney. The Spruce Eats, 2017. Bananas Foster is an epic dessert from New Orleans. Usually served via table-side flambé and completed with a generous helping of ice cream, it is a decadent and richly flavored course that is normally reserved for special occasions. But not to worry; we've created a french toast breakfast casserole version that you can easily make at home! With all of the same amazing flavors of the traditional fancy dessert, but geared towards breakfast, this casserole dish is an excellent option for a weekend brunch or the holidays. Just throw this recipe together the night before and pop it in the oven on Christmas morning and you'll have a delicious and warm breakfast for everyone to enjoy while opening gifts! In a small saucepan combine the butter, brown sugar and corn syrup to make the caramel mixture. Stir the mixture and heat until the sugar has completely dissolved and the mixture starts to bubble about 3-5 minutes. Stir the vanilla and cinnamon into the sugar mixture and then pour it into a 9 x 13-inch baking dish. Layer the sliced banana on top of the sugar mixture. Drizzle the rum over the bananas at this time, if using. Place the cubed bread over the top of the bananas in an even layer. In a medium bowl, whisk together the eggs, milk, sugar, melted butter, vanilla extract, and salt until thoroughly beaten. Pour the egg mixture over the bread cubes. Press down on the cubes so that they submerge more fully in the egg mixture. Cover with aluminum foil and refrigerate for at least 5 hours, ideally overnight. When you are ready to serve, preheat the oven to 375 F and take the french toast breakfast casserole out of the refrigerator. Leave the french toast on the counter while the oven preheats. Bake the french toast, covered for 45-60 minutes. Monitor the casserole and check to make sure that the egg mixture is thoroughly cooked and not runny. Remove the aluminum foil for the last 5-10 minutes for a crunchy top. 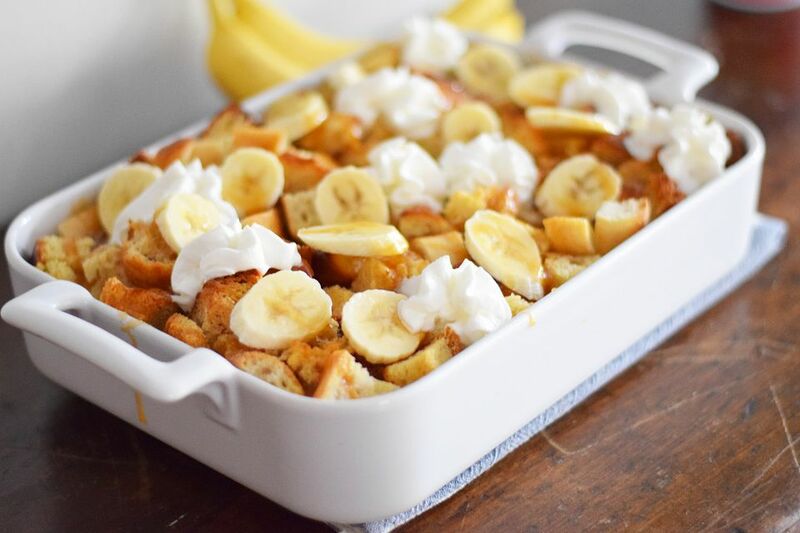 Remove the casserole from the oven and top with additional caramel syrup (can make ahead of time or right after you take it out of the oven), additional sliced banana, and whipped cream. You can also flip the pan upside down onto a plate so that the caramelized bananas are displayed on top. Then top with additional bananas, whipped cream, and caramel syrup.